Greg James was born in Perth, Western Australia. His involvement with art began at 18 when he enrolled at Claremont Technical College (later to become Claremont School of Art) where he studied Fine Art, majoring in Sculpture. He initially worked as a Sculpture Technician for Claremont School of Art before establishing a small foundry in his home studio in 1987. 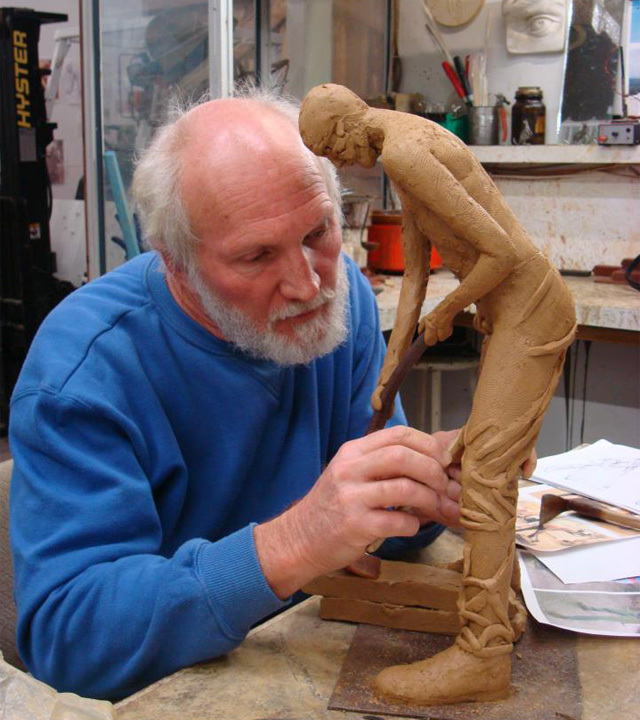 In 1992 he moved his studio to J Shed, where he developed the Greg James Sculpture Studio Gallery. His numerous public sculptures have become well known landmarks throughout Fremantle and Perth, whilst his collectable work is displayed throughout Australia, and in galleries in Ireland, the United Kingdom, and New Zealand. His work has also featured previously in Rome, Paris, London, Berlin, Amsterdam, and Hong Kong. Greg specialises in bronze sculpture, however, he also works with materials such as stone, marble, wood, forton, aluminium and steel, and produces paintings and drawings using acrylics, charcoal, pencil, pastel, oil and watercolour. "The essential inspiration for my work is people. Some of my work is concerned with the artistic representations of individuals and or events based on historical fact, while other works concentrate on interpretations of various elements of the human condition"